QUEBEC – Yorbeau Resources of Montreal says the reports are very positive from metallurgical tests of material from its Scott copper-zinc project 20 km west of Chibougamau. Concentrate grades were excellent, and recoveries good. A 55-kg composite sample was sent to Chibougamau-based Services Métallurgiques Metchib, who conducted the tests in co-operation with SGS Canada in Québec City. The sample was representative of the ratio of massive sulphides and stringer sulphides as estimated in the resources. Two separate concentrates were made. The copper conc averaged 25.4% copper, 6.5% zinc, 8.5 g/t gold and 612 g/t silver. The locked cycle test had an overall recovery of 82% in a 23.3% copper concentrate. The zinc conc graded 0.6% copper, 53.3% zinc, 0.27 g/t gold and 63.6 g/t silver. The locked cycle test had an overall 83% zinc recovery in a 51.1% zinc concentrate. 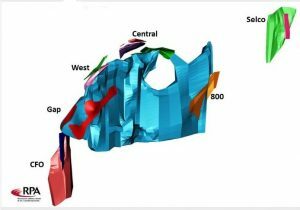 The Scott project has indicated resources of 3.6 million tonnes grading 0.95% copper and 4.17% zinc plus inferred resources of 14.3 million tonnes at 0.78% copper and 3.49% zinc. Additional information is posted at www.YorbeauResources.com.